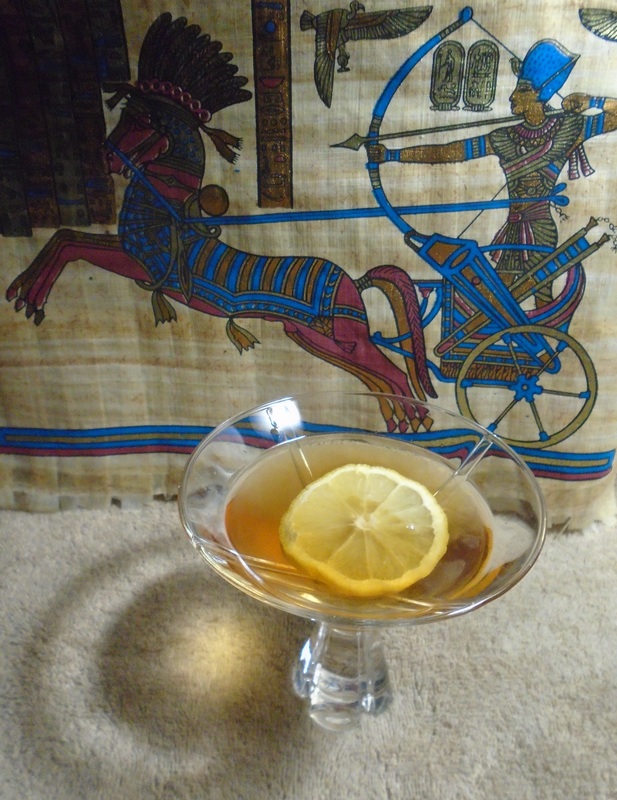 Celebrate the answer and the mystery of life with the Sphinx cocktail! Oedipus famously vanquished the Sphinx of legend with the answer to her riddle: Man. But perhaps, considering his later life, he would have been better off failing the test! As for the cocktail, which may or may not have been named for the mythological creature, is it dry? Is it sweet? It’s a simple, yet complex drink with subtlety in its flavors. The cocktail dates back at least as far as the early 1960s, appearing in the 1964 edition of Old Mr. Boston De Luxe Official Bartender’s Guide. It could be considered a variation of a martini or a Manhattan with gin. Either the way, the key ingredient here is actually the slice of lemon, providing an oh-so-subtle taste of citrus. In a shaker over cracked ice, pour in 1 1/2 ounce of gin and 1/4 ounce each of dry vermouth and sweet vermouth. Shake and then strain into a cocktail glass. Top off with a slice of lemon as a garnish (required). How I like it: I upped the proportions some, adding 2 ounces of gin and 1/2 ounce each of dry vermouth and sweet vermouth. This ratio isn’t exactly proportional, however, and one may wish to experiment slightly for the best flavor if increasing amounts. I also squeezed a bit of the fresh lemon into the drink, giving it more hints of citrus. Don’t be blind to fate, drink responsibly! Note: The version of the Sphinx’s riddle quoted above was taken from Robert Graves’ The Greek Myths (1955).